The specialised taxation rules governing the medical profession are extensive enough to oblige medical practitioners, doctors included, to be vigilant about settling their government dues to keep themselves out of legal trouble. Very often though, busy professionals are likely to overlook important components in their tax returns, which could lead them into serious legal consequences. Writing on PhysiciansPractice.com, Ike Devji offers some tips to help jumpstart effective income protection for doctors, compliments from his friend, CPA TJ Casey. First of all, it’s important for doctors to keep a clear record of personal medical expenses, some of which may be allowable for deductions by the state. Many doctors, unless they are entrepreneurs themselves, don’t even bother to keep track of job-related expenses or outlays. Doctors should learn how to take advantage of state income tax credits, such as allocating part of their income into accredited or state-mandated charity organizations to avail of tax refunds. Record keeping and being on top of expense claims are even more critical concerns for doctors who operate their own medical facility. Work-related travels are relevant as they can take advantage of mileage deductions where one can claim $.55 per mile depending on the state of residence. It’s also important that doctors should be able to report any foreign bank account that is owned as the IRS can charge as much as 50 percent of the account value if these accounts remain unreported. Common tax-deductible items may include medical supplies necessary for the medical practitioner’s professional practice (rubber gloves, precision surgical instruments and the like), office space (if the individual is self-employed), uniforms (if the individual works for an employer), continuing education (this can either be required by an employer or solely the personal choice of the individual), and travel expenses (miles travelled for official business). All of these items and services are subject to various state-specific tax laws under the Affordable Care Act (a.k.a. Obamacare). Financial issues, such as complex tax deductions for doctors, can be too confounding for the fiscally challenged or naïve, and the risks of having to confront the IRS for overlooked income declarations can be daunting. 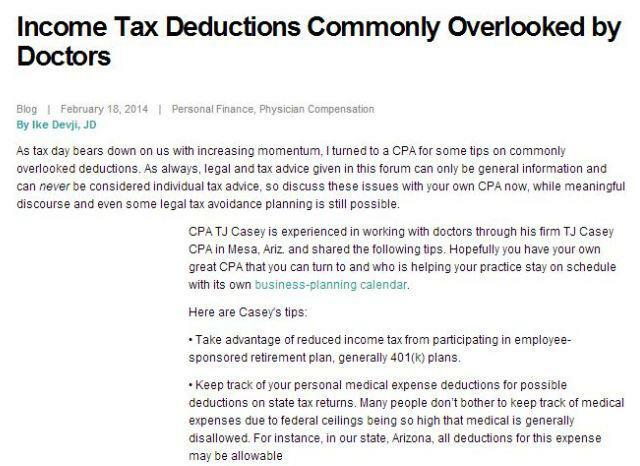 Doctors also miss out on sizeable tax refunds if they fail to itemize their deductibles. Fortunately, help is available and companies like MEDIQ, which specializes in financial management for individual medical professionals and medical practices, can provide the best accounting advice while maximizing income and paying their clients’ proper share in taxes.